Frylock: Life is not about winning material goods, Meatwad. Ignignoct: No, it's about taking material goods when others aren't looking. Run Time: Approx. 201 min. Aqua Teen Hunger Force is an animated series beyond description. It's about three food items�Frylock, a flying container of fries that can shoot lasers out of his eyes; Shake, a milkshake in a fast-food cup; and Meatwad, a wad of meat�who are detectives, except they really never do anything other than hang out in the pool of their fat neighbor. Hmmm, on second thought, I guess that describes it pretty well. Though clearly a little more explanation is warranted. ATHF premiered in 2001 as part of Cartoon Network's "Adult Swim" programming block. Execs conceived Adult Swim, which airs out of prime time, as a way to keep older teens and adults watching Cartoon Network long after they'd tired of the Powerpuff Girls and Johnny Quest re-runs. They scheduled blocks of hard-edged anime (including the popular Cowboy Bebop), failed network series like Home Movies, and newly produced, edgy fare seemingly created with only two guidelines in mind: bizarre humor, and basement budget. ATHF most definitely fulfills the last two requirements. Chris Willis and Matt Maiellaro, two of the minds behind CN's stalwart Space Ghost Coast to Coast and longtime employees of the network, somehow came up with the idea that a show about food detectives who don't actually do anything might be funny. Such genius springs forth only after long periods of creative sabbatical that allow access to the deepest, most surreal essence of the subconscious. If you don't have that kind of time, you can just mainline beer and hallucinogens; I'm guessing that's what Matt and Chris did. Anyway, they were right�ATHF is funny, but it's a certain brand of funny difficult to describe and, I'd wager, polarizing. It's along the lines of Family Guy, smart and satirical one minute, lewd and crude the next, but consistently inspired. And, if it's possible, somehow less coherent than Seth McFarland's ADD-afflicted network castoff (which, incidentally, made an impressive comeback on Adult Swim about a year after the premiere of ATHF). "I want candy, any kind will do, don't care if its nutritious or FDA approved. It's gonna make me spaz like five cats on booze, a hyperactive juice that only I can produce. And build a giant drill, and bore it straight into hell, releasing ancient demons from their sleep-forever spell, so they can walk up on the Earth, and get resituated, and hawk the diet pills MC Pee Pants have created!" MC Pee Pants turns out to be a giant spider who is just lashing out because he's lonely. Incidentally, if you didn't giggle at that rap, don't bother with this show. Because then you certainly won't appreciate the Mooninites, a pair of Moon aliens who look like sprites from Space Invaders and who feel really, really superior about their moon heritage. This two-disc set includes 16 episodes from the series' first two seasons: Rabbot, Escape from Leprechaupolis, Bus of the Undead, Mayhem of the Mooninites, Balloonenstein, Space Conflict from Beyond Pluto, Ol' Drippy, Revenge of the Mooninites, MC Pee Pants, Circus, Dumber Days, Love Mummy, Dumber Dolls, Interfection, Bad Replicant, and PDA. 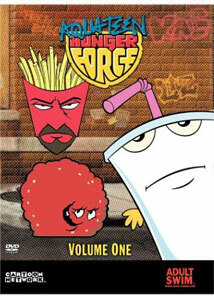 Image Transfer Review: Aqua Teen Hunger Force's simplistic, undemanding animation looks great on DVD. Colors are strong, crisp, and clean, and the source materials look sharp and clear. No complaints here. Audio Transfer Review: I must say, I'm surprised by the quality of this audio mix�it's much better than the limited budget would seem to allow. Granted, it's very front-heavy (I can't say I ever noticed any input from the surrounds), but the front soundstage is very wide, and features repeated instances of stereo separation and directionality in addition to crisp, understandable speech. Extras Review: I never thought I'd see this show on DVD, but Warner has done us Adult Swim fans a favor and released this first volume with great packaging and a small number of worthwhile supplements. The most odd is a rough original cut of the premiere episode, Rabbot. It's about five minutes longer than the one that aired, and includes lots of rough animation and storyboards. It's also rather horribly paced, and it wouldn't even be worth watching had it not included commentary from creators Chris Willis and Matt Maiellaro. They are suitably embarrassed by the slipshod quality, and also talk a lot about how they conceived the show and managed to get the network to bankroll it. It's a decent track with a little more downtime than I'd like. The creators also talk over Space Conflict from Beyond Pluto and Mayhem of the Mooninites, two of the set's funnier episodes. Disc Two's main menu also has a few easy to find easter eggs, both of them deleted scenes from episodes on Disc One. Rounding out the extras is a funny clip produced for the San Diego Comic-Con that features the return of the Mooninites and their terrible, slow-moving laser of death. Aqua Teen Hunger Force is an admittedly acquired taste. The animation is terrible and the humor is tangential and bizarre, but I love it. If you've seen and enjoyed other material from Cartoon Network's Adult Swim programming, then this is probably a safe bet. Warner's DVDs are nicely packaged and a welcome surprise�I never thought I'd see this stuff on DVD.